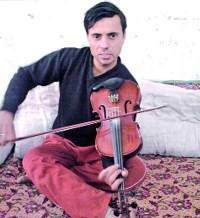 Paras Mani Choudhary, a resident of Jasola, has set a new record of playing the violin non-stop for 50 hours. | LEARN TO PLAY THE VIOLIN FOR FREE! Paras Mani Choudhary, a resident of Jasola, has set a new record of playing the violin non-stop for 50 hours. He achieved this feat at a public performance and in the process beat the previous record of 32 hours. His feat has been acknowledged in Limca Book of Records. Before this, Paras had entered the Limca Book of Records after playing sitar for 92 hours, two years ago. For the current record, Paras had started playing violin on January 14 at Manav Mangal Public School in Prahladpur and stopped after completing 50 hours on Sunday afternoon. The audience at the recital included eight jury members from Limca Book of Records. “Music is in my soul. I can play music for hours and I love it. It’s like meditation for me. By doing this, I want to send across a message of peace. There were many people who came and enjoyed while I was setting a record. I hope more and more people get encouraged and start associating with music,” said Paras. Born in Bhagalpur, Bihar, Paras started showing interest in music at the age of 13. Being from a family which had an inclination towards music, learning was never a problem for young Paras. His first tutor was his mother, Heera Devi, from whom he learned the basics of music. But his real training began when he landed in Delhi in the year 1999. With a dream to be the best, he approached A S Gill Maharaj to fulfill his dreams and joined his music academy in Faridabad. After spending seven years at the academy, Paras approached Pandit Debu Chaudhari to learn sitar in 2008. A year’s training with his guru filled him with so much confidence that he decided to set a world record by playing it for 92 hours and 35 minutes. via Non-stop playing the violin for 50 hours set World Record ~ Breaking World Records 2011 | Limca Book Records 2010 | Guinness World Record 2011 Video.